In a large mixing bowl, combine the Bisquick™, hazelnuts, egg, oil, Nutella™ and cocoa powder. Add in the milk, and whisk together all ingredients until mostly smooth. Don’t worry about getting all the lumps out—overmixing makes for tough waffles. Heat a waffle iron to medium-high heat. Spread about 1/2 cup of the waffle batter into the waffle iron. Close lid and cook for 3-5 minutes, or until the waffle stops steaming. 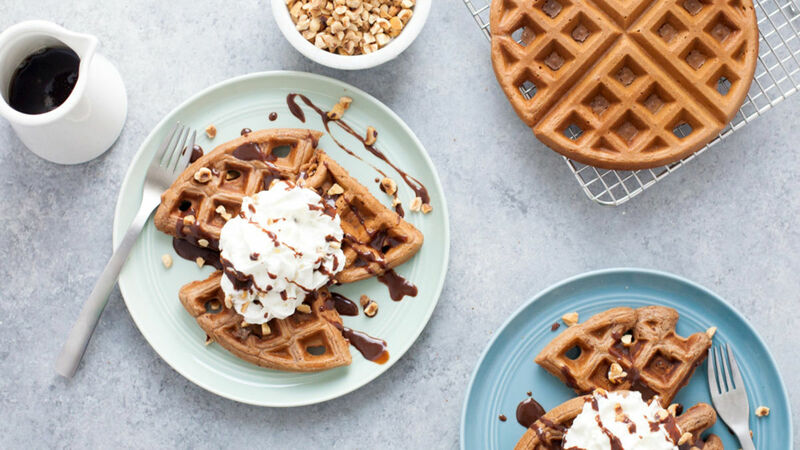 Remove waffle from the waffle iron, set aside, and repeat with remaining batter. You should get about six regular-size waffles out of each batch. Top with additional Nutella™, hazelnuts, whipped cream and maple syrup before serving.